Desccription: 100% computer load testing ensures optimal performance and durability by incorporating real-world parameters during the test cycle of the pump. Manufacturer Part Number:15909826. Manufactured with premium grade, high temperature seals for added durability under all driving conditions. Precise bushing alignment prevents premature shaft and seal wear, reducing noise and vibration. Supplied with caps to prevent contamination from trapped debris. 1 Year Warranty. This is Non-OEM Product, Accessory Only. Fittment: 1997-1999 Chevrolet C1500 Note: Low or no pressure from the power steering pump. Power steering pump loss of pressure may be a result of dirty or contaminated fluid. Check to make sure that the relief valve is working properly by following steps below. Remove pressure calve retainer nut. Desccription: 100% computer load testing ensures optimal performance and durability by incorporating real-world parameters during the test cycle of the pump. Manufacturer Part Number:11883621. Interchange Part Number:21-5290. Manufactured with premium grade, high temperature seals for added durability under all driving conditions. Precise bushing alignment prevents premature shaft and seal wear, reducing noise and vibration. Supplied with caps to prevent contamination from trapped debris. 1 Year Warranty. This is Non-OEM Product, Accessory Only. Fittment: 2001-2003 Acura CL 2001-2002 Acura MDX 1999-2003 Acura TL 2003-2004 Honda Pilot Note: Low or no pressure from the power steering pump. Power steering pump loss of pressure may be a result of dirty or contaminated fluid. Desccription: 100% computer load testing ensures optimal performance and durability by incorporating real-world parameters during the test cycle of the pump. Manufacturer Part Number:2K0422154A. Interchange Part Number: 1JO422154H. Manufactured with premium grade, high temperature seals for added durability under all driving conditions. Precise bushing alignment prevents premature shaft and seal wear, reducing noise and vibration. Supplied with caps to prevent contamination from trapped debris. 1 Year Warranty. This is Non-OEM Product, Accessory Only. Fittment: Fit for Volkswagen Beetle Golf GTI Jetta Note: Low or no pressure from the power steering pump. Power steering pump loss of pressure may be a result of dirty or contaminated fluid. Check to make sure that the relief valve is working properly by following steps below. Desccription: 100% computer load testing ensures optimal performance and durability by incorporating real-world parameters during the test cycle of the pump. Manufacturer Part Number:21-5349. Interchange Part Number: 56110RCAA01. Manufactured with premium grade, high temperature seals for added durability under all driving conditions. Precise bushing alignment prevents premature shaft and seal wear, reducing noise and vibration. Supplied with caps to prevent contamination from trapped debris. 1 Year Warranty. This is Non-OEM Product, Accessory Only. Fittment: 2003-2007 Honda Accord 3.0L V6 Note: Low or no pressure from the power steering pump. Power steering pump loss of pressure may be a result of dirty or contaminated fluid. Check to make sure that the relief valve is working properly by following steps below. Desccription: 100% computer load testing ensures optimal performance and durability by incorporating real-world parameters during the test cycle of the pump. Manufacturer Part Number:21-5919. Interchange Part Number:56110PAAA01. Manufactured with premium grade, high temperature seals for added durability under all driving conditions. Precise bushing alignment prevents premature shaft and seal wear, reducing noise and vibration. Supplied with caps to prevent contamination from trapped debris. 1 Year Warranty. This is Non-OEM Product, Accessory Only. 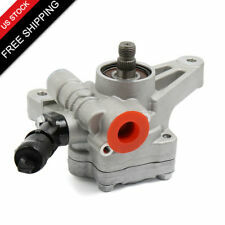 Fittment: 1998-2002 Honda Accord 2.3L Note: Low or no pressure from the power steering pump. Power steering pump loss of pressure may be a result of dirty or contaminated fluid. Check to make sure that the relief valve is working properly by following steps below. Desccription: 100% computer load testing ensures optimal performance and durability by incorporating real-world parameters during the test cycle of the pump. Manufacturer Part Number:21-5442. Manufactured with premium grade, high temperature seals for added durability under all driving conditions. Precise bushing alignment prevents premature shaft and seal wear, reducing noise and vibration. Supplied with caps to prevent contamination from trapped debris. 1 Year Warranty. This is Non-OEM Product, Accessory Only. Fittment: 2003-2013 Honda Acura MDX 2005-2010 Honda Odyssey 2005-2008 Honda Pilot Note: Low or no pressure from the power steering pump. Power steering pump loss of pressure may be a result of dirty or contaminated fluid. Check to make sure that the relief valve is working properly by following steps below. 2002-2006 Nissan Altima. 2003-2008 Nissan Maxima. 2004-2009 Nissan Trucks Quest. Desccription: 100% computer load testing ensures optimal performance and durability by incorporating real-world parameters during the test cycle of the pump. Manufacturer Part Number:56100PLA033. Interchange Part Number:56100PLA033RM. Manufactured with premium grade, high temperature seals for added durability under all driving conditions. Precise bushing alignment prevents premature shaft and seal wear, reducing noise and vibration. Supplied with caps to prevent contamination from trapped debris. 1 Year Warranty. This is Non-OEM Product, Accessory Only. Fittment: 2001-2002 Honda Civic 1.7L SOHC Note: Low or no pressure from the power steering pump. Power steering pump loss of pressure may be a result of dirty or contaminated fluid. Check to make sure that the relief valve is working properly by following steps below. Description: Plastic squeeze bottle dispenser with cover cap, use for industrial manual glue, gel, engine oil, dispenser. To load lubricant oil or other liquid, not acid or alkali liquid. Bottle ONLY. Oil or liquid not included here. The capacity is 100cc. Method of Using: pour into oil, liquid or glue, twist the long neck funnel, and cut with scissors (the incision size according to the need you want to control) Package Included: 1 x Industrial Oil Bottle. Description: Plastic squeeze bottle dispenser with cover cap, use for industrial manual glue, gel, engine oil, dispenser. To load lubricant oil or other liquid, not acid or alkali liquid. Bottle ONLY. Oil or liquid not included here. The capacity is 150ml. Method of Using: pour into oil, liquid or glue, twist the long neck funnel, and cut with scissors (the incision size according to the need you want to control) Package Included: 1 x Industrial Oil Bottle. Description: Plastic squeeze bottle dispenser with cover cap, use for industrial manual glue, gel, engine oil, dispenser. To load lubricant oil or other liquid, not acid or alkali liquid. Bottle ONLY. Oil or liquid not included here. Method of Using: pour into oil, liquid or glue, twist the long neck funnel, and cut with scissors (the incision size according to the need you want to control) Package Included: 2 x Industrial Oil Bottle. Description: Plastic squeeze bottle dispenser with cover cap, use for industrial manual glue, gel, engine oil, dispenser. To load lubricant oil or other liquid, not acid or alkali liquid. Bottle ONLY. Oil or liquid not included here. The capacity is 250ml. Method of Using: pour into oil, liquid or glue, twist the long neck funnel, and cut with scissors (the incision size according to the need you want to control) Package Included: 1 x Industrial Oil Bottle.